Kip and Michael plant a new bare-root Rosa 'William Morris' at the Victory Garden. Everybody loves roses in their garden and for planting you can always visit your local nursery to choose from a number of pre-potted varieties. But when you just can't find what you're looking for, there's another option that affords the keen gardener an even wider array of choices — bare-root roses by mail order. Whether through catalogs or via the Internet, ordering bare-root roses is easy, costs about the same, and requires only a little extra preparation for planting. Mail-order roses have been held in cold storage and come to you with their roots bare (thus the name). After a few straightforward steps they're ready to go in the ground. Prepare the soil with a generous dose of compost. Immediately upon arrival, the roots of the rose need to be rehydrated, which you can do by soaking them in a bucket of water for up to 24 hours. Following rehydration, the rose needs to be planted right away. This is the one crucial detail of working with bare-root roses: once you start the process in motion (ordering the rose), you need to finish the job swiftly. If you don't have the time to put it in the garden immediately, you should refrigerate the rose to keep the roots dormant until you're ready to plant, or else you'll have to pot it up. But be aware that if you pot your rose, it can't be transplanted until it has formed its new roots in the pot, which can take several months. After that, you can safely take the rose out of the pot and transplant it to your garden. Roses love rich soil with a lot of organic material. After digging a generous hole — which should be spacious enough for spreading the roots out — prepare the soil by adding compost and working it into the bottom of the hole. 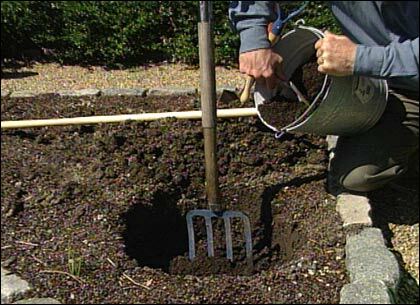 After adding your organic material, form a cone-shaped mound of soil in the center of the hole. This will serve as the seat for your rose. Use a tool handle to position the rose at the proper level in the hole. Place the rose atop the mound you created. Next, you're going to make sure the rose is at the right level before backfilling the hole. 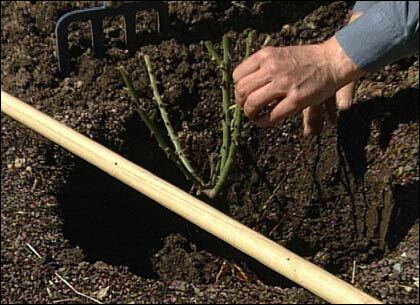 To do this, take a rake, or some other tool with a long handle, and lay it across the hole to see where the soil level will be in relation to the rose's grafting nodule (the swelling at the base of the rose stem). In the South, where the climate is warmer, the nodule can be at soil level or even slightly above it. 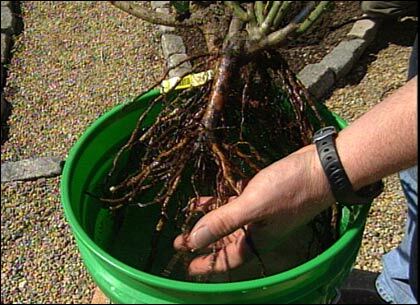 But in the colder northern climes, the grafting nodule needs to be a couple of inches below soil level — which will prevent it from freezing — so root growth won't be lost and your rose will do much better. After you have properly positioned the rose in the hole, spread the roots out so they travel in all directions, which will also help to establish the plant in its new home. Then, backfill the hole until the roots are just barely covered and water the rose. Watering your rose at this level, instead of on the surface of a completely filled-in hole, allows the soil to settle better around the roots; you want to get your rose started in a very moist environment with no air pockets. The last step is to fill in the hole completely. This segment appears in show #2808.